School and university, and the well-trodden path between them, play a dominant role in thinking about education policy. But outside these two institutions there exists a less well understood world of colleges, diplomas, certificates and professional examinations – the world of post-secondary vocational education and training. A 2015 study by the OECD - ‘Learning for Jobs’ has shown that nearly all countries are facing rapid change, and intensifying challenges in ensuring that higher level vocational education and training (VET) programmes respond effectively to the needs of the labour market. What type of training is required to meet the needs of changing economies? How should programmes be funded? These are just some of the questions being asked across the globe. In the United States, for example, it is estimated that one third of all vacancies by 2018 will call for some post-secondary qualification, but not necessarily the completion of a four-year degree. And whilst some countries have thriving post-secondary vocational sectors, others have found it difficult to find a place for shorter one-or two-year programmes in competition with better known academic qualifications. Developing Asia and the Pacific provides a rich array of technical, vocational education and training experiences, but too often these have recorded only modest results. On the whole, training and skills development systems in developing countries are not fully equipped to produce graduates with competencies that are aligned to the needs of the labour market. Emphasis is placed on learning through activity and will appeal to those who wish to pursue an alternative learning pathway to that of the purely academic. 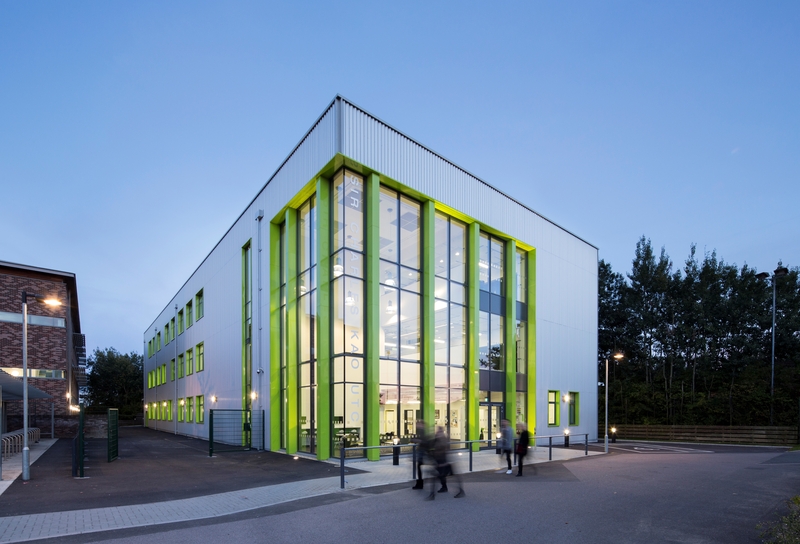 Scott Brownrigg has designed a wide selection of vocationally focused education buildings, including schools, University Technical Colleges (UTCs) Studio Schools, Further Education (FE) Colleges and Universities. Each brief has different requirements and a variety of spaces which facilitate flexibility in the pedagogical approach. As technology advances and solves problems, jobs which did not previously exist become available. Nearly two-thirds of overall growth in the EU is forecast to be in the technical and associate professionals category. Sir Charles Kao UTC has been set up to focus on engineering and ‘Smart’ technologies. The ‘Intelligent Flat’ designed by Scott Brownrigg within the new UTC building is unique within UK education in aiming to provide a replica future home environment where the latest smart technologies can be tested by students and visitors. This supports an understanding of the circular, iterative process of design and engineering where the first attempt is rarely the final design, but is instead a result of testing and tweaking until the end result meets all the functional requirements. These more specialist spaces are supported by classrooms and seminar rooms. Flexible circulation space ensures all areas in the building facilitate teaching and learning. People-focused areas of vocational training vary widely, from the health and wellbeing of individuals with links to the medical industry, through to the arts and hospitality industry. Here, real-life catering for the needs of paying customers is part of the students’ course. Mulberry UTC specialises in delivering the ‘behind the scenes’ aspects of the performing arts, however the curriculum on offer includes Healthcare, Medical Services and Digital Technologies. The building layout at lower levels has been driven by the functions of a professional theatre, with supporting spaces behind including scene dock, construction workshop and lighting workshops. The theatre and studio theatre will provide the opportunity to maximise the use of the building throughout the day, welcoming guest productions to paying customers whilst giving students an insight into the supporting roles within the performing arts. The healthcare floors have been designed to reflect the specialisms of the UTC professional sponsors- Bart’s Healthcare NHS Trust. Here there is provision to simulate day-to-day life in a hospital or even recreate a hospital emergency scenario, such as the aftermath of a terrorist attack or pandemic. Digital technology underpins everything done in the building and is distributed throughout specialist spaces such as a “simulation suite”. The tight site drove a relatively tall building response at six-storeys, however this has not restricted the ability to fill the UTC with inspiring spaces. These have been designed to be flexible and adaptable to meet the changing needs of the syllabus. Traditionally, construction and manufacturing provided considerable scope for vocational training. In the UK, exemplar infrastructure projects such as Crossrail, HS2, and the Heathrow Airport expansion are an opportunity to learn from experts in the field. At Swindon UTC, located in the Grade II Listed Railway Village, Scott Brownrigg has repurposed historic buildings associated with the construction of the railway and reimagined them as a modern education campus with an engineering focus. The scheme combines refurbished historic engine sheds with a new hub building providing a heart to the school. The retained structures are grand spaces filled with natural daylight which makes them ideal for workshops. 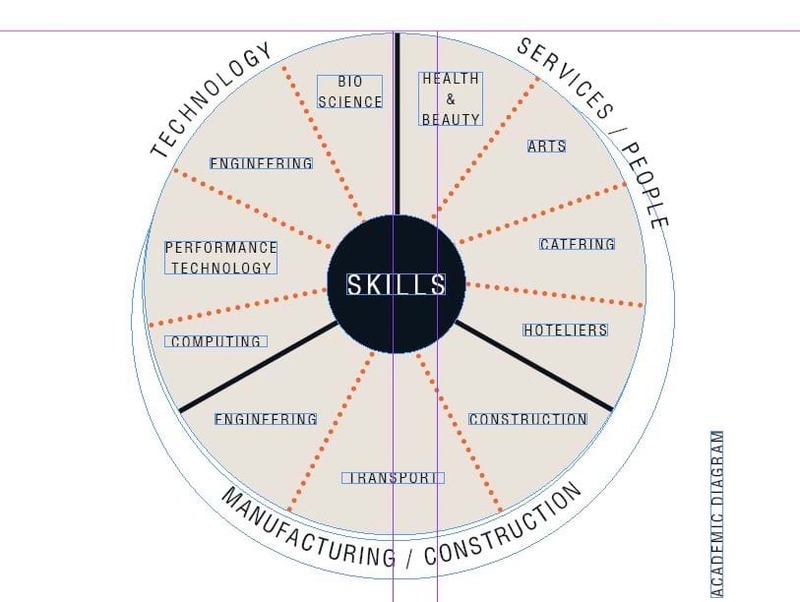 Within the vocational sector, unifying subject areas is a core requirement. Spaces must be able to change and adapt. Flexibility is delivered through the provision of a mixed and varied selection of spaces clustered for ease of use and accessibility. These are supported with flexible furniture and equipment, digital technology, and power. Every space, whether inside or out, within a room or a circulation route, is a teaching and learning space. Vocational education has equal value to academic alternatives, and provides a genuine route to employment, preparing pupils for life, and providing skills transferable around the globe. Scott Brownrigg brings innovative thinking to the debate, while creating exciting and inspiring spaces for students regardless of culture or background.